Since his death in 1986 the playwright with the nom de plume of "Copi" has become very popular in France. Copi was born Raul Damonte in 1939 in Buenos Aires and after moving to Paris in 1962 became an artist, actor and later writer of plays in French. He received the Grand Prix de Littérature de la Ville de Paris a few days before his death. I was able to attend the Belgian première of his last play UNE VISITE INOPPORTUNE ("An Untimely Visit"). No less an arbiter of culture than the Comédie Française used it to open the 2001-02 season at their Studio Théâtre. On the basis of the production at the Théâtre du Grand Midi, it is well nigh impossible to understand how Copi in general or this play in particular could merit the extravagant praise both have received. (The director claims the play is a modern equivalent to Shakespeare's "The Tempest" or Chekhov's "The Cherry Orchard"!) One suspects that much of the interest lies in the fact that this play about an actor dying of AIDS was written by an actor dying of AIDS. But Copi has confounded all expectations raised by various American "AIDS plays" by framing UNE VISITE not merely as a comedy but as a parody of boulevard farce. In UNE VISITE the dying Cyril (Francis Besson), reclining on his gurney in a dressing gown, smoking a hookah of opium and acting very much like Lewis Carroll's Caterpillar, has to contend the constant intrusion of his female nurse Madame Bongo (played by a man, Bernard Damien) and of his male doctor Professor Vertudeau (played by a woman Annette Brodkom). He receives a steady stream of presents from friends including food (rather inappropriate for someone hooked up to an IV). His friend Hubert (Christophe Herrada) comes to arrange his funeral much to his displeasure and a handsome young journalist (Laurent Renard) comes for an interview although he never asks Cyril a single question. The titular visit comes from death herself in the guise of an unhinged opera diva Regina Morti (Anne-Marie Cappeliez). The death-obsessed diva, frustrated by Cyril's lack of interest, kills herself, after several attempts, has a brain transplant to little effect, kills herself again, revives and kills herself a third time. Nurse Bongo, previously infatuated with Cyril, falls in love with the doctor and they abandon Cyril to go on a honeymoon to Africa, where they will treat AIDS patients. Cyril himself has two death scenes--one seemingly to get rid of everyone followed by the "real" one. His final word is "Shakespeare". Copi's point seems to be that life itself has become such bad theatre that it is impossible write a play about a dying actor, and worse an actor dying of AIDS, without parodying theatrical clichés. The trick for a director is to find just the right tone to allow us to laugh at the increasingly surreal goings-on while not missing the seriousness of Copi's critique. Director Claude Enuset has not found this balance. The play he claims is "la plus hilariante de Copi" resembled nothing more than a series of fifth-rate television sketches. The acting was either so understated as to be uninteresting or so over the top, as with Cappeliez, as to be obnoxious. 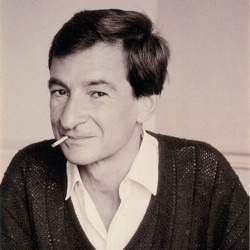 As Cyril, Francis Besson seemed more to be playing Ugo Tognazzi's Renato in La Cage aux Folles than any real character. Enuset seems not to have realized that a farce is funniest when the characters view their situation with utmost seriousness. The Théâtre du Grand Midi had had a great success with Copi's La Balle des folles which later went on to tour. UNE VISITE, however, was greeted with little laughter and only tepid applause.